David Cameron, speaking at the annual CBI conference, has said that there are too many judicial reviews that slow down planning applications. In reality, only a small number of the applications for judicial review are for planning, with the majority being for immigration and asylum. But Cameron makes the rather strange analogy that the UK is in a situation (?) akin to the second world war, and everything must be done to boost the economy. The Ministry of Justice did not have access to the number of reviews there have been related to building and planning. Downing Street refused to identify any infrastructure projects which had been delayed by judicial review, saying it was “not going into specific examples. FoE’s Andy Atkins said the planning system played “an important role in protecting our green and pleasant land” and it must not become a scapegoat for the government’s economic failings. Cameron has proposed changes to make it harder to apply for judicial review, altering the timing, cost and Halving the number of opportunities to challenge a refusal of permission for a judicial review from four to two. Objectors’ rights to mount legal challenges to projects they oppose are to be restricted in an effort to speed up development and boost economic growth, the Prime Minister announced in a speech this morning. David Cameron, speaking at the annual conference of industry group the Confederation of British Industry (CBI), also pledged to reduce the time taken by government to consult on policies and to streamline European legislation with the aim of getting new railways and roads built quicker. Cameron said he was “determined to dismantle some of the procedures that have been slowing us down”, such as the over-use of judicial reviews to overturn decisions, including planning permissions. He said: “This is a massive growth industry in Britain today. Back in 1998 there were four and a half thousand applications for review and that number almost tripled in a decade. “Of course some are well-founded – as we saw with the West Coast mainline decision. But let’s face it: so many are completely pointless. Halving the number of opportunities to challenge a refusal of permission for a judicial review from four to two. The Prime Minister also said ministers would have the power to decide how long consultations would take, instead of the current statutory three-month period, and if, they believe there is no need for one, to not have one at all. Cameron further promised to cut “excessive European legislation” and to make sure such legislation is interpreted by Whitehall in a more flexible way. Cameron said he wanted to halve the amount of time it takes to get roads upgraded but gave no further details on how this would be done. Speaking about the proposals to change the judicial review process, justice secretary Chris Grayling said that last year “only one in six applications determined were granted permission to be heard and even fewer were successful when they went ahead”. A Ministry of Justice spokesman said a public engagement process on the judicial review plans “will be carried out shortly” with the next steps, including proposed details on the changes to time limits and costs, to be set out in the New Year. The UK became signatories (i.e. ratified it) in 2005. It is not clear how government can deny the people it represents access to justice. and contains – as the title suggests – three broad themes, also called pillars. Pillar III aims to guarantee citizens and environmental NGOs the right of access to justice and enhance their involvement in environmental law enforcement. It seeks to achieve this by guaranteeing them access to review procedures when their rights to information, participation or environmental laws in general have been breached. See Arhus Convention Jan 2006 – a Postnote from the Parliamentary Office for Science and Technology. David Cameron has promised to crack down on “time-wasting” caused by the “massive growth industry” in legal challenges to government policy. The prime minister told business leaders he would “get a grip” on people forcing unnecessary delays. He added that there was a “gap between what the PM says and what the PM does”. 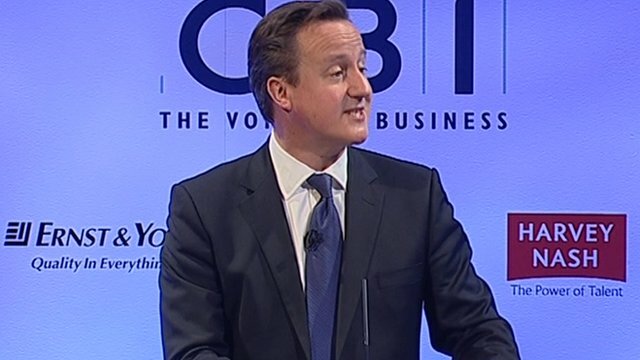 In his speech to the CBI conference in London, Mr Cameron said the government had been “too slow” at cutting the deficit. He pledged to end “equality impact assessments”, which need to be carried out when new policy or legislation is introduced. He insisted that “bureaucratic nonsense” was not necessary to ensuring the rights of different sexes, races and religions were upheld. The review, carried out by a judge, looks only at the way the decision was reached – rather than whether it was correct or not. A recent example was Virgin’s successful challenge against the awarding of the West Coast Mainline rail franchise to First Group. It was found there had been “significant flaws” in decision-making. BBC legal correspondent Clive Coleman said the majority of these had related to asylum cases, which was where the “real growth” had taken place. But Mr Cameron said that “instead of giving hopeless cases up to four bites of the cherry to appeal a decision, we will halve that to two”. Downing Street refused to identify any infrastructure projects which had been delayed by judicial review, saying it was “not going into specific examples”. He argued that government was “too slow in getting stuff done” and that civil servants must appreciate delays were felt in “businesses going bust, jobs being lost” and “livelihoods being destroyed”. Mr Cameron drew a historical analogy, saying: “When this country was at war in the ’40s, Whitehall underwent a revolution. “Normal rules were circumvented. Convention was thrown out. As one historian put it, everything was thrown at ‘the overriding purpose’ of beating Hitler. For Labour, shadow local government minister Jack Dromey told BBC Two’s Daily Politics: “This is the same prime minister who kicked into the long grass a decision on airports for at least three years. And Friends of the Earth’s Executive Director Andy Atkins said the planning system played “an important role in protecting our green and pleasant land”. He added: “It mustn’t become a scapegoat for the government’s economic failings. How common are ‘time-wasting’ appeals against government? Prime Minister David Cameron has expressed his determination to crack down on “time-wasting” caused by the “massive growth industry” in legal challenges to government policy. But just how real is this problem? The figures for judicial review quoted by the prime minister are overall figures. In other words, they cover all judicial reviews and not just those in respect of building and planning developments, or judicial reviews related to business growth. There were 11,200 applications for permission for judicial review last year. And that does represent a trebling of the overall figures in around a decade. But what the prime minister did not say is that the majority of those applications are in one area – immigration and asylum. That is where the real growth has been. They represented half of all cases in 2001. That rose to three quarters of all cases in 2011. What does that seem to tell us? Simply that outside immigration and asylum, there has been a modest increase, and not a huge explosion of cases. The figures are categorised as immigration, crime and “other”. It is that “other” category – and the commercial planning and building judicial reviews within it – that the prime minister seemed to be focusing on. However, “other” includes all sorts of cases, not just judicial reviews that relate to commercial planning and building. 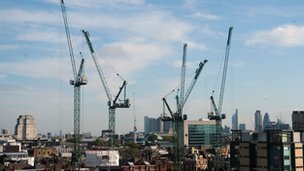 The Ministry of Justice told the BBC that it does not have any figures for the number of reviews related to building and planning. But lawyers who practise in this area say that it may be a very small number of cases. One said it could be a “vanishingly small” number. It was his view that there really are not a lot of judicial reviews holding up commercial building projects. Where everyone acknowledges that there is a real problem is that the courts are clogged up, and once the initial permission is granted, it can take years for a “JR” to be heard. So, there has been a rapid growth in the numbers of cases waiting to be tried. Some lawyers argue that is more of a resourcing problem for the courts system and that if more judges were assigned to judicial review cases, the problem could be eased. Campaign group Stop Bristol Airport Expansion have been refused permission for a judicial review against North Somerset Council’s approval of the airport’s plan. Mr Justice Collins, at London’s High Court, said the decision adhered to Government aviation policy (the out of date ATWP 2003) and even if that policy was flawed, legally it should stand. They had argued that climate change was a local, national & international issue, and thus relevant to airport expansion. Feb 9, 2011 … and could easily be overturned by the Judicial Review. … commence as if the Judicial Review had already been decided, and so this closure … The legal challenge to Southend Airport’s runway extension has been thrown out. The judicial review application by a campaigner against the runway extension plans was dismissed by a High Court judge this week, it was confirmed today. Both the airport and campaigners Stop Airport Extension Now (SAEN) said they had received confirmation from the court about the judge’s decision. SAEN has learned that a renewal of claim for permission to apply for Judicial Review has been filed with the High Court. This means that a 20-minute hearing in front of a High Court judge will take place later this year. for as long as possible in the hope of obtaining a better price. Apr 1, 2011 … Rival Belfast International Airport was granted leave to seek a judicial reviewof the decision to remove the annual seats for sale restrictions. A legal challenge to the lifting of a cap on passenger numbers at Belfast City Airport is to proceed to a full hearing, a High Court judge has ruled. [Rival airport] Belfast International Airport was granted leave to seek a judicial review of the decision to remove the annual seats for sale restrictions. A residents’ group, Belfast City Airport Watch Ltd, has issued similar proceedings. The decision on passenger numbers was announced by Edwin Poots in December. Nov 17, 2010 … to the High Court on Thursday in a judicial review. Campaigners against the Royal Docks airport expanding to 120,000 flights a year … The High Court has granted permission for Fight the Flights to take their legal challenge against Newham Council to a full hearing in the High Court. The Judicial Review will look at the legality of Newham Council’s decision to approve the expansion of London City Airports. The Court granted permission to proceed on all three limbs of Fight the Flight’s case saying that all aspects of the case were properly arguable. Posted: Monday, November 19th, 2012. Filed in General News, Recent News.